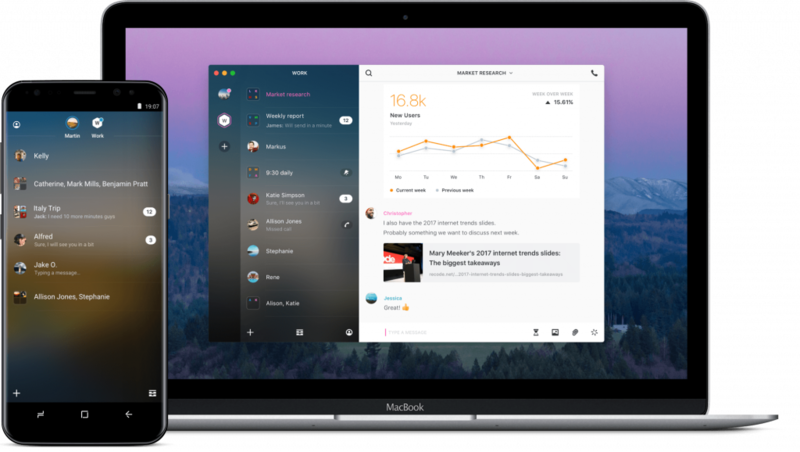 Slack is one of the best-known team chat and collaboration tools. It offers a variety of features such as real-time chat for internal communication, video calls and lots of integrations. However, it’s not always the best solution for work communication. So, we went ahead and put together a list of the best Slack alternatives for you. There can be many reasons why you may be looking for Slack alternatives. Many have noted that because Slack is team-centric, they often end up having 10 Slack teams as new “inboxes” to check. Others may find the 10,000 message history limit crippling, dislike the lack of ‘Read’ indicators to see who’s read your messages. Or you may miss having native task management inside the collaboration tool where discussions happen and decisions are made. The good news is that there are a lot of Slack competitors on the market. Some of them are near-identical to Slack in their capabilities, others are quite different, which means that they may fit your workflow even better than Slack! We did the research for you and selected 25 of the best solutions for this overview of Slack alternatives. Check out their top features, pricing, and find the best one for you and your company. Of course we’re biased, but hey — it is our blog. Here’s our #1 Slack alternative. 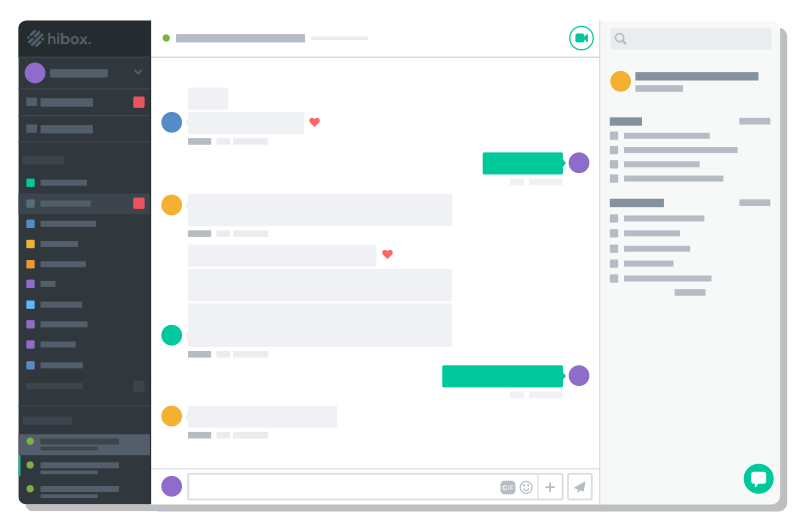 Fleep has everything you need for ultimate team collaboration: team chat, video and voice calling, native task management and integrations. Why this tool stands out: Fleep may just be the best solution for you if you work with people outside your team as much as you do internally. Unlike most team communication tools, Fleep does not confine you to a siloed team-only space. Instead, you can communicate and collaborate with any other Fleep user, belong to several teams and work with any other team on the Fleep platform. Rocket Chat is one of the top open source slack alternatives. It is designed for anyone who wants to host their own chat service. Why this tool stands out: Rocket Chat is completely free to use and you can make it completely your own by means of customization. The downside of open source projects, though, is that there’s no official customer service (although you can seek help in the online forums on GitHub). 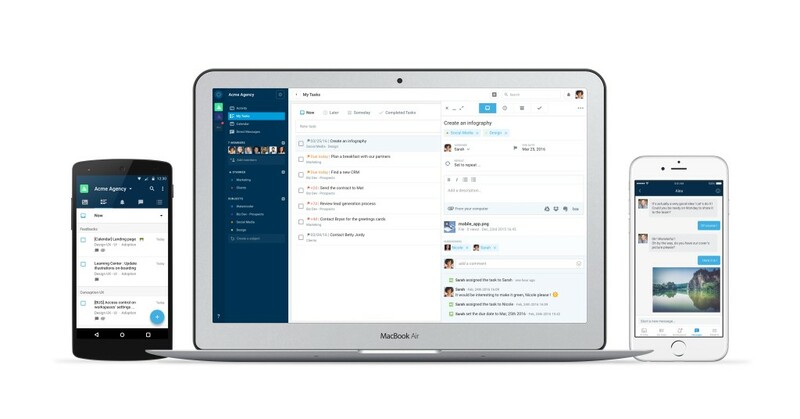 Mattermost is an open source Slack alternative, just like Rocket Chat. Even more, Mattermost is self-hosted, promising modern communication behind your firewall. Why this tool stands out: Mattermost stands out as the open source Slack alternative that can also be self-hosted. Ryver integrates group chat, task management, and a powerful workflow engine into one app, and promises to keep it affordable for teams of any size. 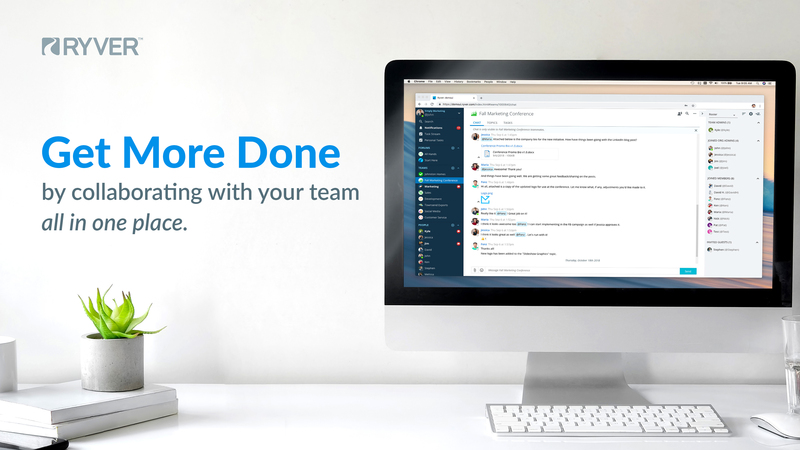 Why this tool stands out: Ryver offers a combination of team chat, task management, and workflow automation in one app. Other apps require integrating multiple apps for such functionality. Additionally, Ryver’s flat-rate pricing is very straightforward. Flowdock has a unique way of combining team chat and team inboxes of differences services on a single, shared dashboard. It promises to replace chat applications in your workflow and free your mailbox from automated emails. Why this tool stands out: Flowdock has focused on integrating your entire team’s workflows and services into their application, so you can always have an overview of what your team is working on. 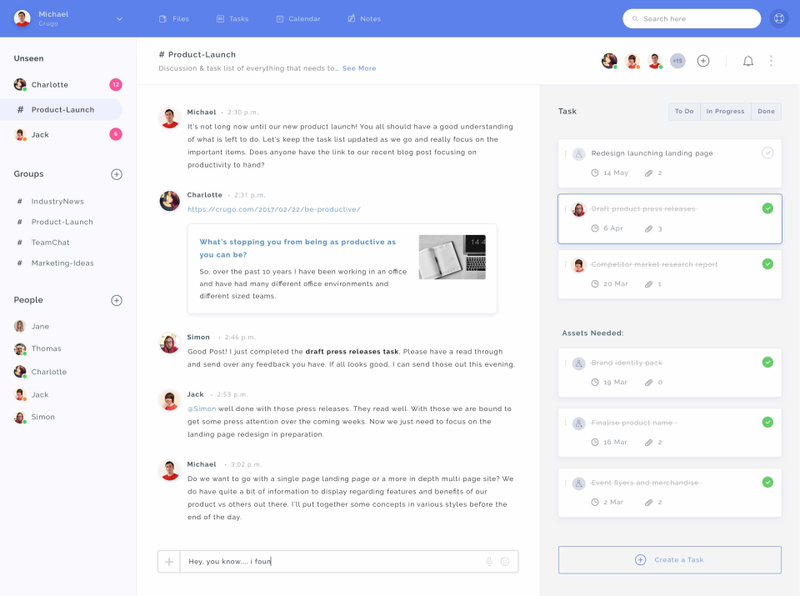 Flock is a collaboration hub for your team. It is a messaging platform, promising to bring all your team’s communication and information together in one place. Why this tool stands out: In general, Flock is not too different from Slack. The main differentiating feature is that in Flock, you can turn discussions into tasks by creating to-dos for you and your team, and add due dates to them. Additionally, Flock’s is more affordable than a lot of the other options. Twist is a communication tool by Doist. According to Twist, it offers a calmer and more organized way to work together. Why this tool stands out: The team behind Twist is betting against real-time messaging. So, Twist is designed for asynchronous communication. This shows in how Twist is set up completely differently from most team chat tools that optimize for instant communication. In Twist, threads keep all conversations clearly separated by topic so responses do not get buried in an endless stream of group chat. Microsoft Teams is a group chat software offered as a part of Microsoft Office 365. 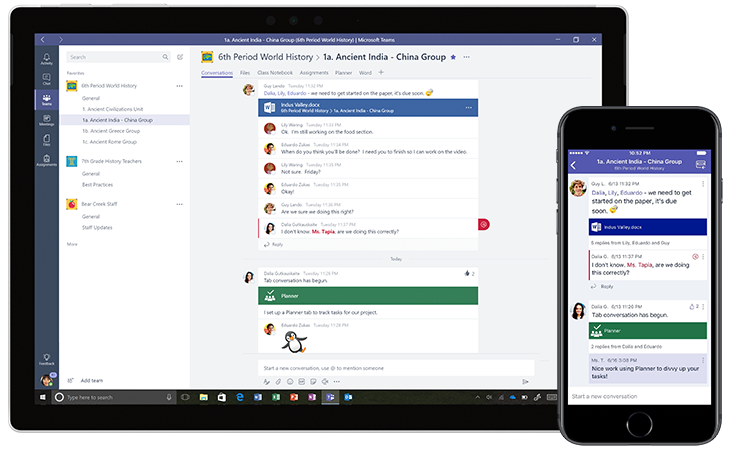 When it launched, many perceived Microsoft Teams as the conglomerate’s competitor to Slack. Even later updates to Microsoft Teams draw parallels with Slack (e.g. “Microsoft Teams is properly taking on Slack now”). The main difference is that Microsoft Teams is not a product, it’s a feature — it does not come as a separate product, but only with Office 365. Why this tool stands out: Because it’s Microsoft. What this means is that the whole experience is optimized for large and medium enterprises — unlike most of the others on this list. 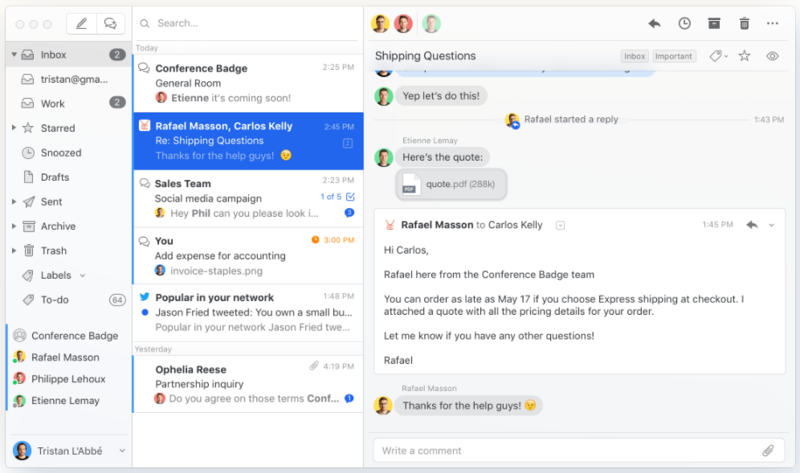 So, if you’re at a big company that uses Microsoft Office 365 already, then it is highly likely Microsoft Teams will be your company’s chat-based tool of choice. 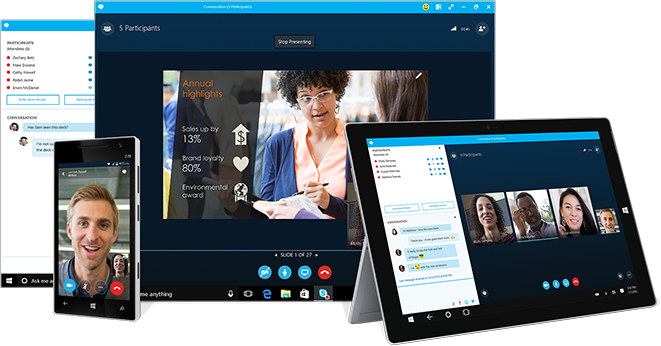 Skype for Business, also a Microsoft product (formerly known as Microsoft Office Communicator and Microsoft Lync) is an instant messaging software available with Microsoft Office 365. 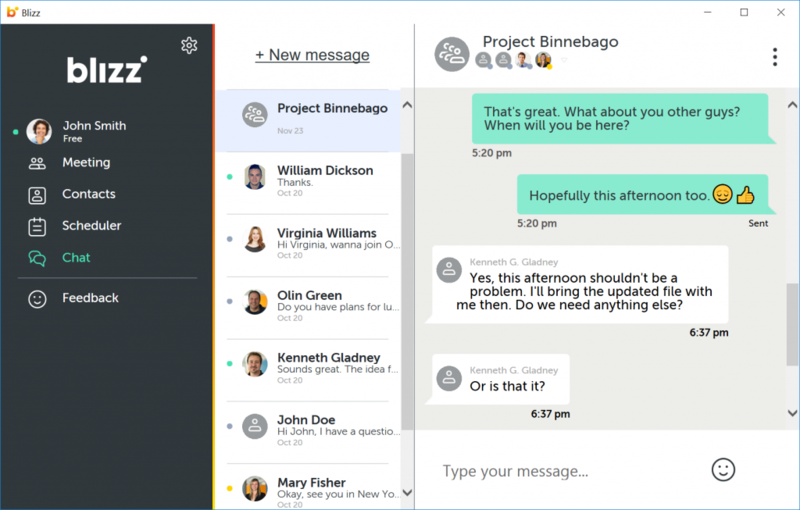 Why this tool stands out: Skype for Business keeps its focus on “meetings”, i.e. voice and video conferencing. Separate from Microsoft Teams and Yammer, but still a part of Microsoft’s portfolio, Skype for Business is best suited for the distributed teams that have a need for a lot of voice or video calling. As such, less focus is put on other collaborative features or messaging itself. 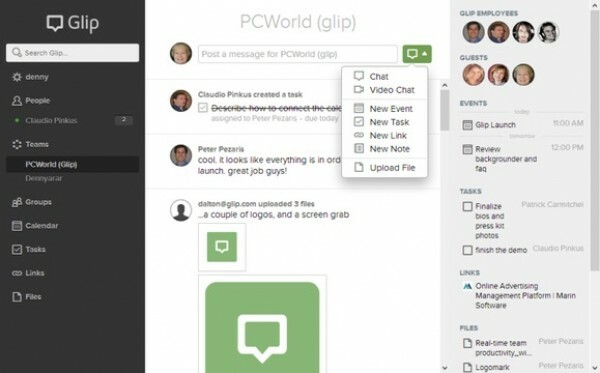 RingCentral Glip is a team messaging and collaboration app that promises better, faster team collaboration. Why this tool stands out: While nothing really stands out about Glip, it does have more built-in features (like document collaboration, Calendar and Tasks) than Slack or your average Slack alternative. Pricing: Free plan for unlimited everything (posts, storage, integrations, guest users) and 500min of shared video chat. Standard plan at $5 / user / month with 1,000 min of shared video, advanced administration controls, Data retention policies etc. Wire started out as a beautiful, secure instant messaging app. Since then, Wire has been re-invented as a secure collaboration platform, more geared for work communications. Why this tool stands out: Wire is one of the very few team communication or collaboration apps that comes with end-to-end encryption. As such, “secure” is Wire’s unique selling point. Chanty is a simple AI-powered team chat tool that toots its own horn as a top Slack alternative. It promises seamless team communication, for free, forever. While it is still in beta, it is worth keeping an eye on Chanty in the coming years. Why this tool stands out: Chanty’s key differentiator seems to be a focus on AI for “smart responses”, so you don’t have to type your replies in routine cases where Chanty is able to predict it. Still to be seen whether Chanty will take this AI approach even further from smart replies. 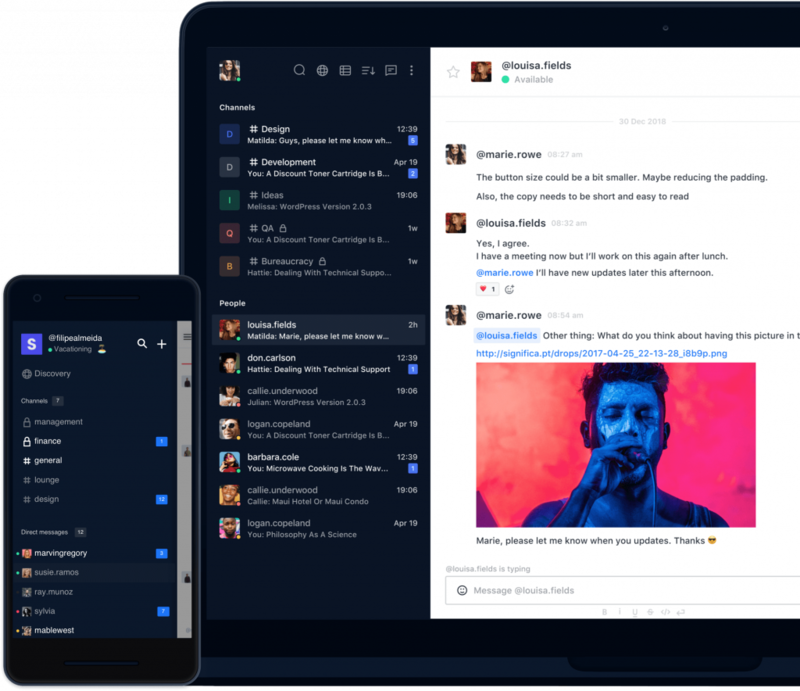 Missive is a communication app that combines email and chat. 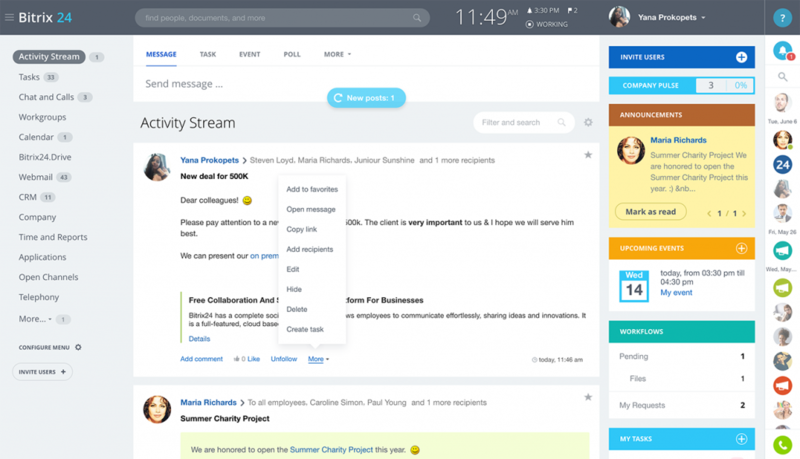 Missive makes it possible to collaborate around any inbox, and use team chat within the same tool. Why this tool stands out: While many collaboration tools claim to “kill email” or want to move you away from email, Missive embraces email. 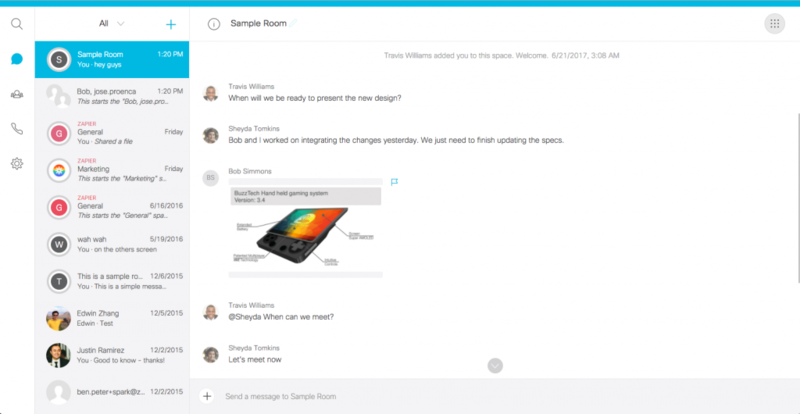 It makes email collaborative, and allows for chat around that collaboration. Even more, they recently added functionality that lets you collaborate on social media and SMS accounts. Pricing: Basic functionality can be used for free, and upgrades available from $8 / user / month. 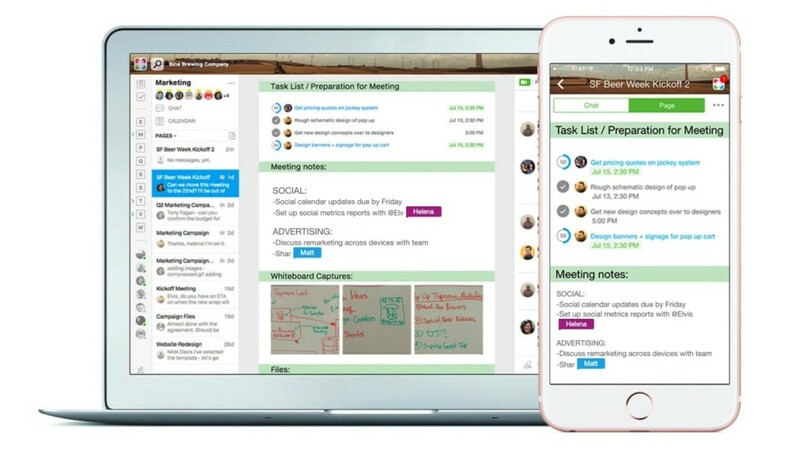 JANDI is a business messaging app with built-in workplace productivity features. According to Forbes, it is South Korean contender to the list of companies catering to the business communication needs of the Asian market. Why this tool stands out: While nothing major stands out about JANDI, it’s all in the details. As a PR representative explained in an interview to Forbes, JANDI optimizes their user experience to fit the culture and expectations of the Asian market — from emoji galore to allowing for a more hierarchical structure inside the app, and not openness as a lot of the US and Europe-based companies might. 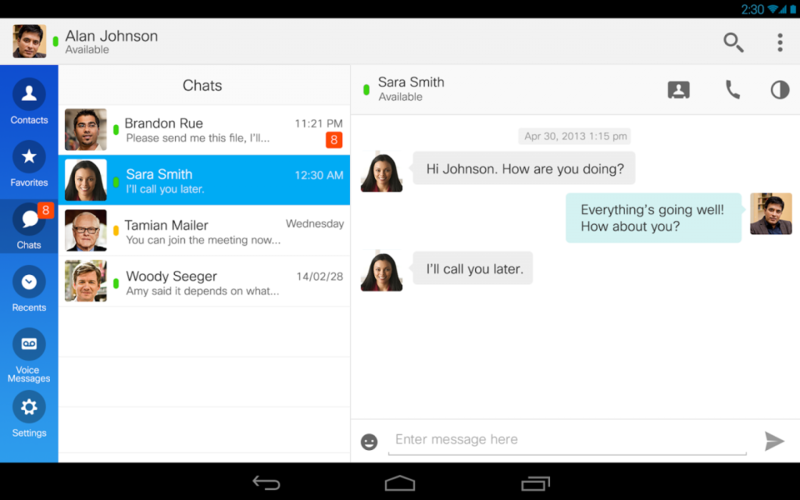 Google Hangouts is a communication platform that offers messaging, video chat, SMS and VOIP functionalities. While Google has a history with messaging products, Google Hangouts has managed to stick around for quite a bit and it doesn’t look like it’s going anywhere. Why this tool stands out: The functionality of Google Hangouts leans towards instant messaging and voice chat. However, combined with all other G Suite products and functionality, it may just fit your team well for communication. Pricing: All functionality is free, including calls to Hangouts users, but other calls might be charged. Cisco Webex Teams (previously Cisco Spark) is teamwork app with video meetings, group messaging, file sharing and interactive whiteboard drawing. Pricing: From $24 per month for up to 8 people, to $69 per month for up to 100 people. Jabber, another Cisco product, combines instant messaging, voice and video calling, desktop sharing, conferencing and presence. 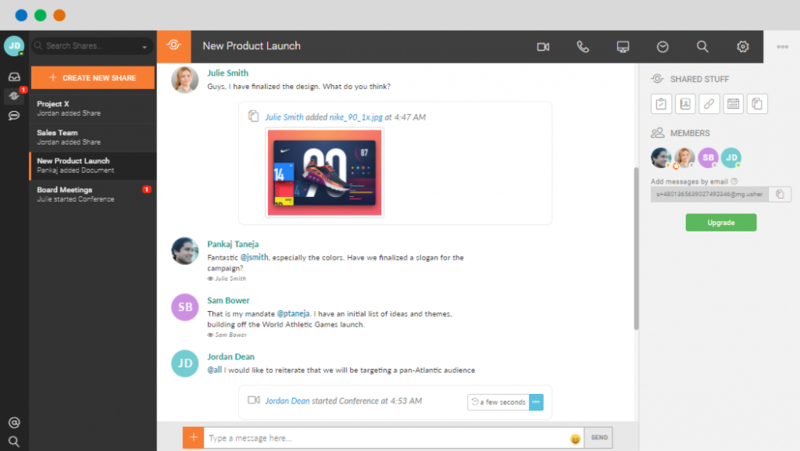 Why this tool stands out: Cisco Jabber is definitely a corporate chat tool that works well with other Cisco products (Outlook, WebEx, Cisco phones). As such, it stands out as a tool for corporations that use other Cisco products as well. Pricing: Cisco Jabber is available on a quote basis. You can contact the vendor for pricing details or to request a quote. 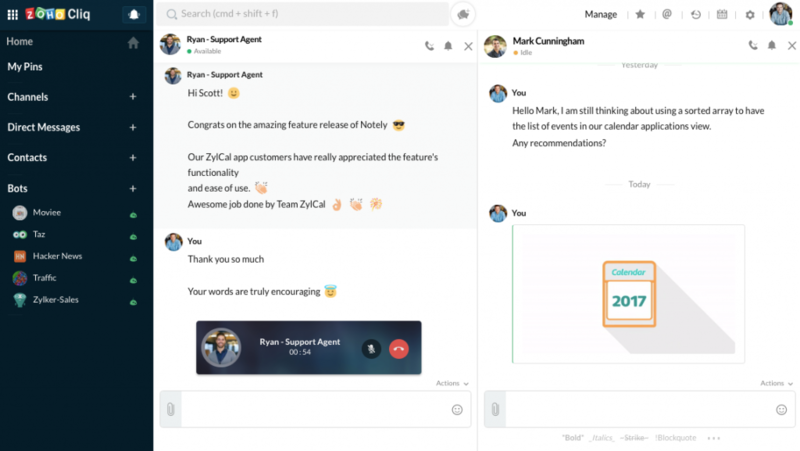 Zoho Cliq (previously Zoho Chat) is their chat tool that is built for work. On Zoho Cliq, you can communicate, collaborate, and reach consensus. Zoho itself is a company that specializes in low-cost, online office software, promising to automate your entire office. Zoho Cliq is a part of this offering. Why this tool stands out: Zoho Cliq is one of the few team messengers that has a column-style user interface. That means you can open several conversations in the same window, rather than switch between them. Zoho Connect, another Zoho product, is a team collaboration software that takes the form of a social network. While it is much more than a team chat app, it has all the functionality for internal team communication and more. Why this tool stands out: Zoho Connect stands out for its social take on collaboration. Much like an intranet, Zoho Connect promises you’ll have everything you need for collaboration in one place, not just the chat. 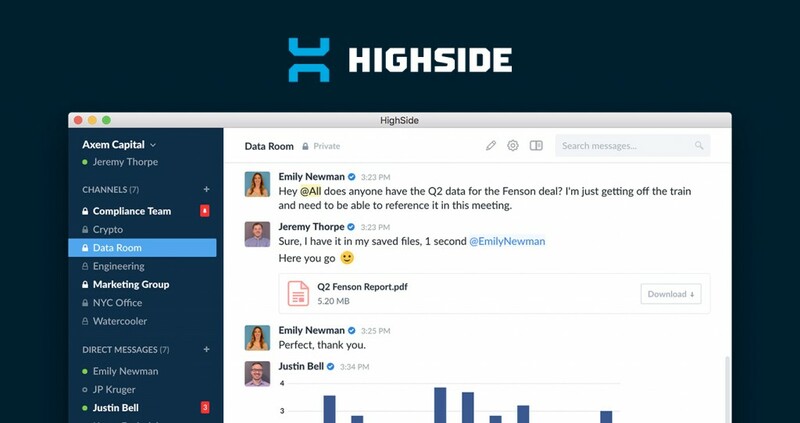 HighSide (previously ClearChat) is a secure Slack alternative for organizations handling regulated or sensitive data. Their goal is to develop the world’s most secure team chat, file sharing and file storage platform, and make it easy enough for an organization’s least technical member to use. Why this tool stands out: While it’s still early days for HighSide (it’s in beta), there’s no question about what makes it stand out — it’s security! HighSide is betting on high levels of security and compliance with the highest level requirements. Hibox is a collaboration tool that integrates team chat, video conferencing and task management with AI assistance. Why this tool stands out: Hibox combines three key functionalities of team collaboration into one. While it is not the only tool to integrate team chat, video calls and tasks, Hibox also has an Artificial Intelligence assistant bot that adds an entire layer of functionality to the tool. Blizz from TeamViewer keeps your team connected through chat messaging, video and voice calling, screen sharing, and more. Why this tool stands out: Blizz is definitely all about communication. They have thought through and implemented all the functionality necessary for written communication and calls. From messaging to voice calls, conferencing and even session recording, they’ve got you covered when it comes to communication. Hubgets offers real-time communication for teams of all sizes. Instantly reach your team members through voice, video and chat from your browser, while having access to your entire business knowledge base. Why this tool stands out: Hubgets has approached communication and collaboration a little differently, allowing for communications beyond instant, real-time messaging. Their Boards and Topics offer knowledge sharing and communication in new, unique formats that really stand out. Pricing: Limited functionality available for free, paid plans from $2.50 / user / month. uShare.to calls itself a “workplace technology” for rich, private label team communication. Its functionality includes conferencing, chat and sharing information from any collaboration system in instant workspaces. Why this tool stands out: Service providers can private label uShare.to — and this is something Slack and most Slack alternatives do not offer. 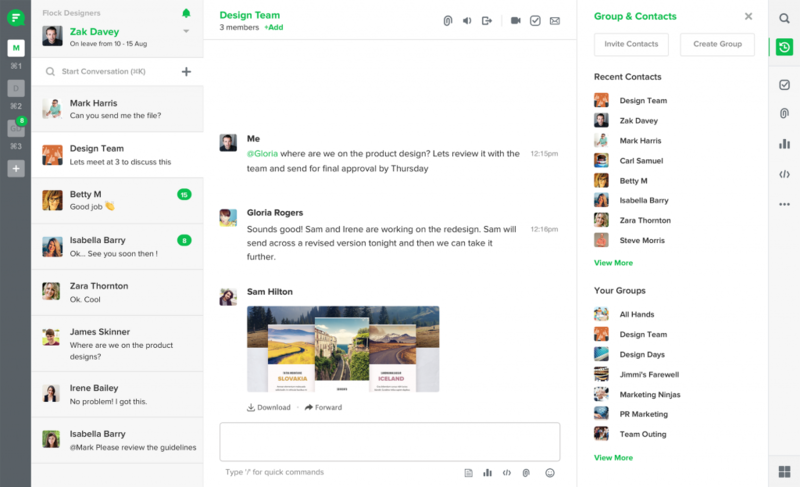 Crugo does position itself as an alternative to Slack, but goes beyond team chat and video calling, as it also offers tasks and calendars on its team collaboration software. Why this tool stands out: Crugo is a nice solution that goes the extra mile to offer an all-round collaboration tool with task management and calendar scheduling. While doing our research, we found a ton of tools that can work as Slack alternatives, but are different enough that we decided to list them separately. So, below we’re highlighting three Slack alternatives that take the form of a social network for work and seven tools that pack in way more functionality than Slack — but can still work well as alternatives to it. 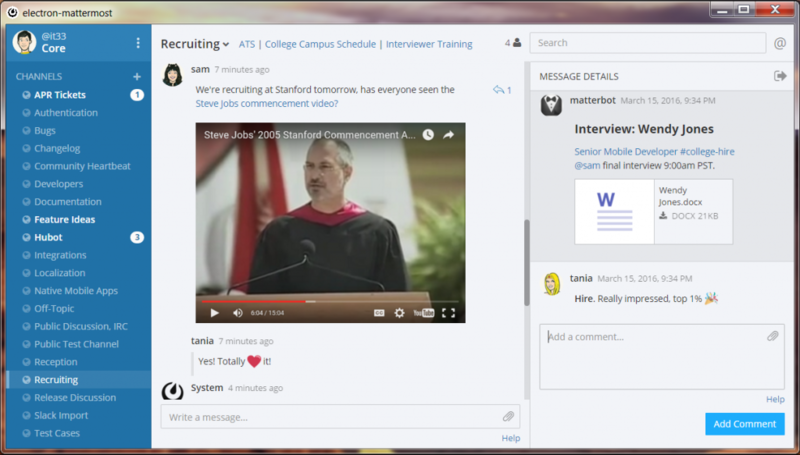 Yammer is much more a social network for the workplace than a team chat application. Nevertheless, it fits into the Slack alternatives list pretty well. 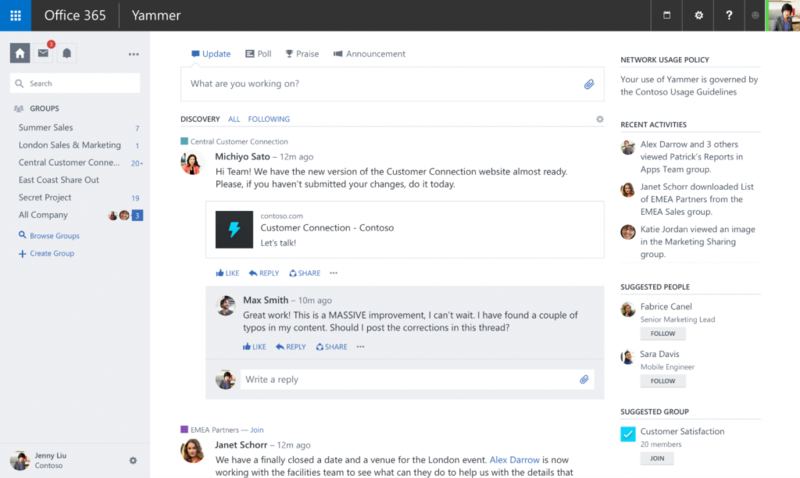 That’s because at its core, Yammer is all about connecting with people across your organization to work together. Why this tool stands out: For some companies, collaboration is very social. Yammer is definitely for those companies, as it functions as a social network for your company. So, while most Slack competitors are team chat tools — Yammer is for team collaboration in a slightly different, more social setup. Pricing: Free for core features, $3/month per user for Yammer Enterprise. Also, Yammer Enterprise is already included with SharePoint Online and Office 365 Enterprise plans. 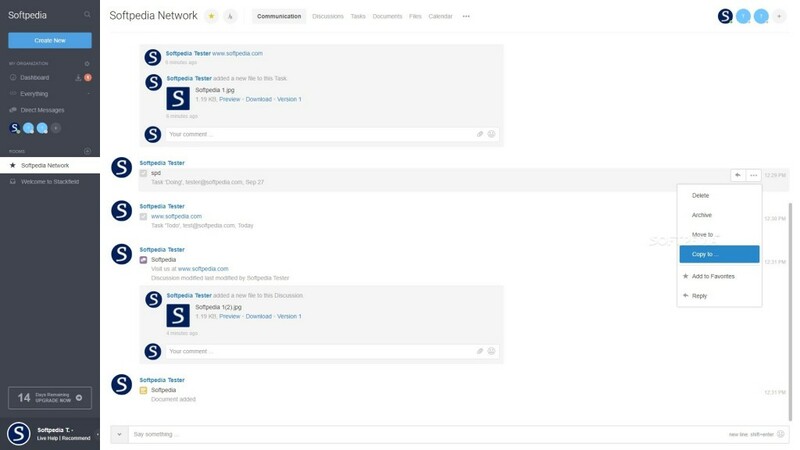 Workplace is a collaborative platform made by Facebook. You can use it to communicate with colleagues, and it also offers social network features for a corporate environment. 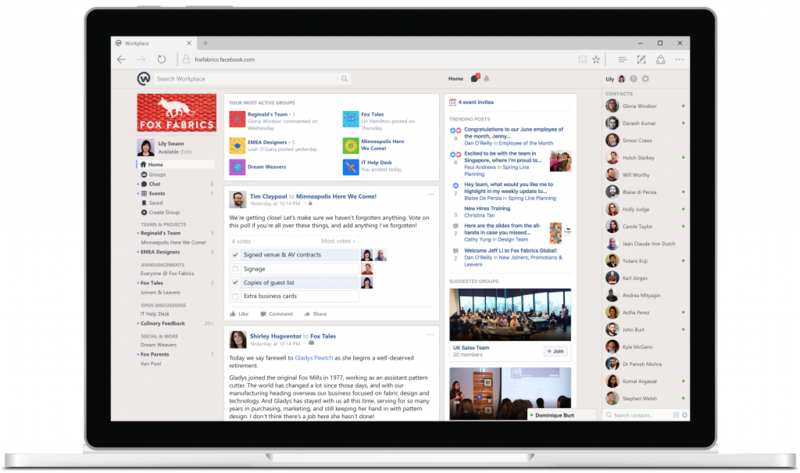 Why this tool stands out: Workplace stands out as the “Facebook for work”. It’s a social network first and foremost, for community and culture building, communication, collaboration in the workplace. Pricing: Core features are available for free, and the premium tier with enterprise features and customer support costs $3 / user / month, with a 90-day free trial. 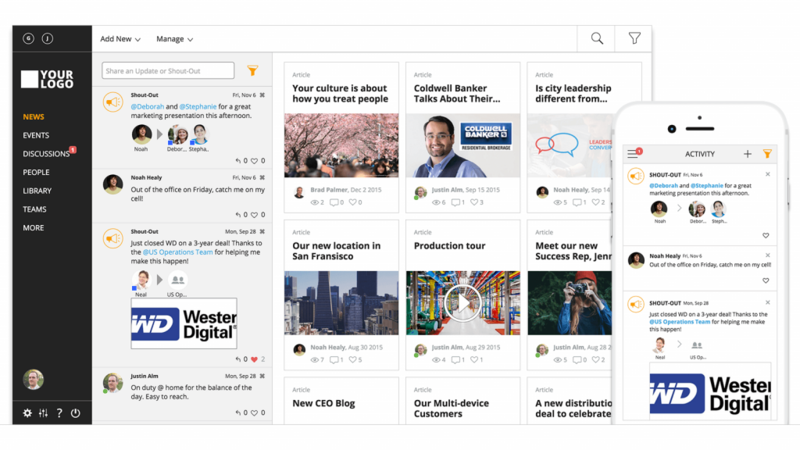 Jostle is a cloud-based intranet software that works as a communication platform (and more!) for companies internally. Why this tool stands out: As an intranet software, Jostle obviously stands out on this list. As such, a lot of Jostle’s user interface is dedicated to channels for sharing announcements one-way, and the two-way communication (discussions) is just another part of the interface. 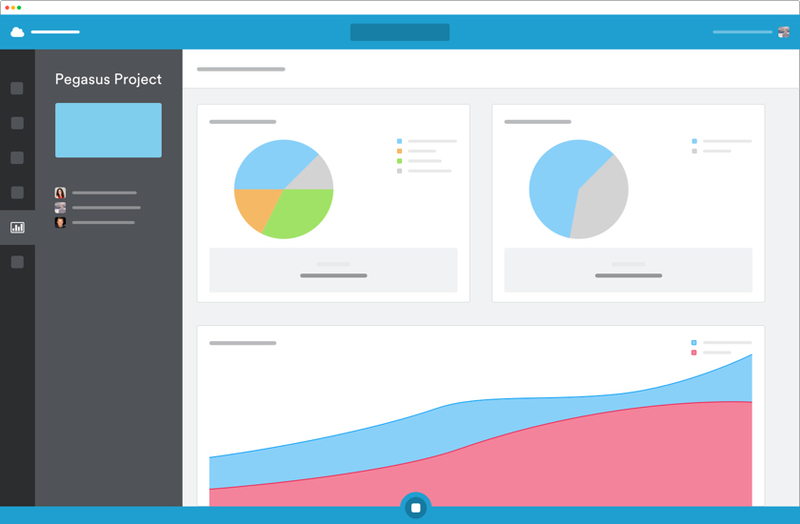 ProofHub is an easy to use project management and online collaboration tool. It promises to your teams, projects and clients together in one central place. 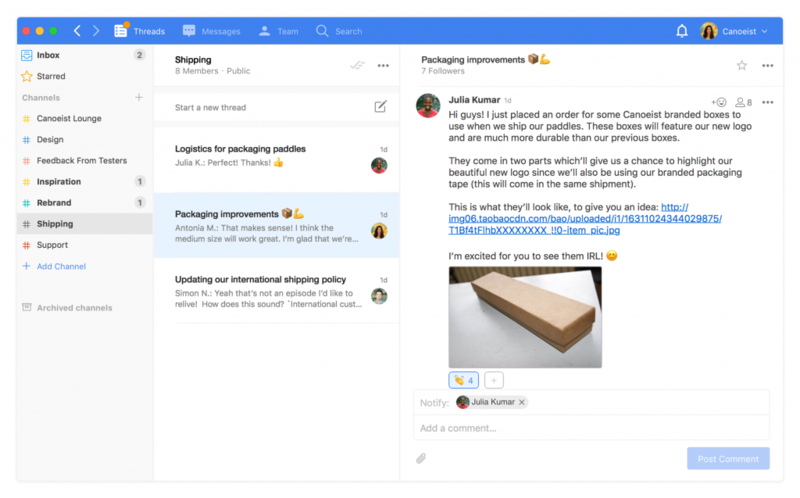 Why this tool stands out: ProofHub is a proper project management software that qualifies as a Slack alternative only insofar as it offers some communication features via “discussions” and group chat features. 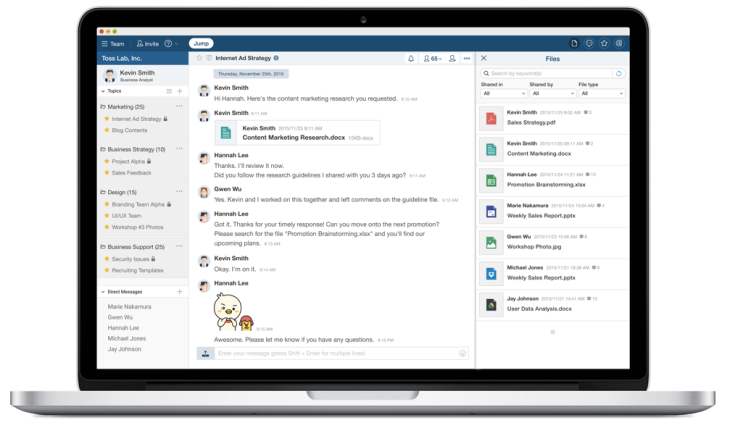 Bitrix24 offers a free collaboration platform that combines communication with CRM, task management, projects, time tracking and documents sharing. Why this tool stands out: Bitrix24 is much more than a Slack alternative, as it offers a comprehensive suite of social collaboration, communication and management tools. So, it stands out in how it promises a complete solution that ensures ease of communication. Pricing: There’s a range of pricing options, from the Free plan to paid cloud plans ranging from $39/month to $199/month, and self-hosted versions. 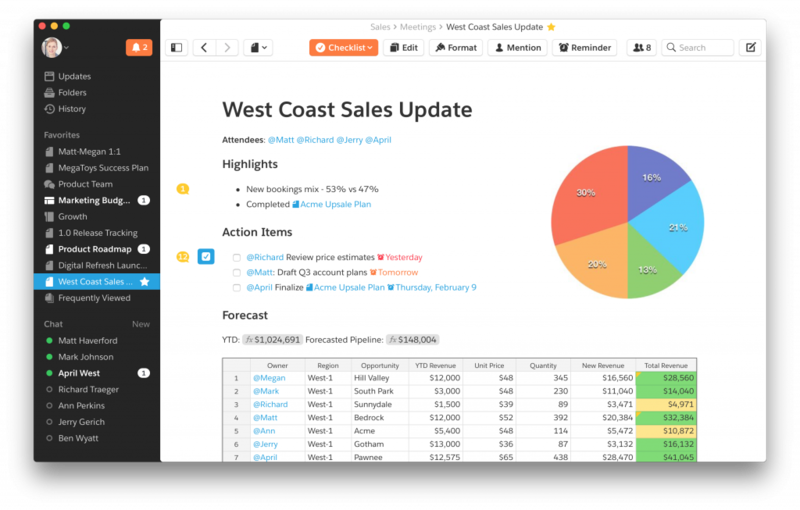 Quip is a productivity suite that combines documents, spreadsheets and checklists with team chat. So, it’s definitely more than just a Slack alternative. With very experienced founders and 13 (!) office dogs, Quip is on a mission to build a new class of productivity tool. 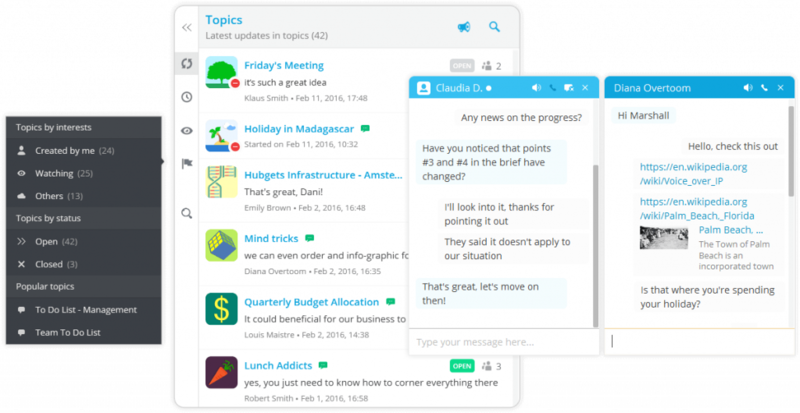 Why this tool stands out: Quip is one of the few on this list that does not put team chat at the centre of their tool, but rather combines it with other elements of their suite, documents and spreadsheets. It’s a unique approach, and definitely worth a closer look if you’re looking for a collaboration suite. Pricing: $30 / month for a team of five, and $10 per every additional user. Moxtra is not just a chat platform, it is a multi-layered collaboration workspace providing conversations, meetings and content on demand. Why this tool stands out: While Moxtra definitely is a Slack alternative, it is much more complex than that. Moxtra is a sophisticated project management platform, with an emphasis on collaboration alongside communication. This is evident in its features: robust document collaboration, video conferencing, electronic signature, and more. 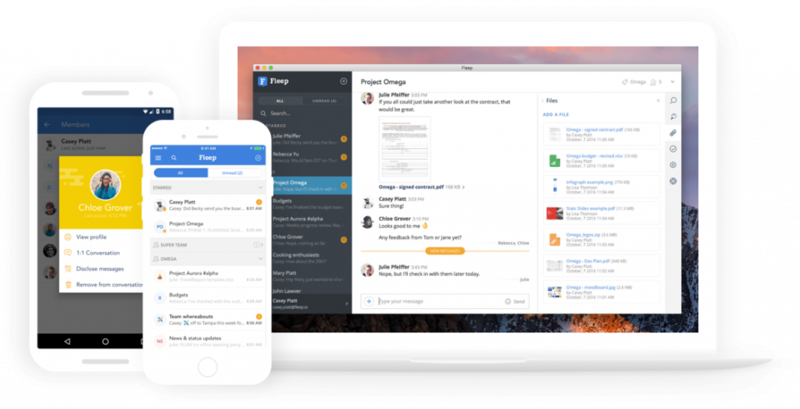 Samepage is a collaboration software combining team chat, video conferencing, task management, file sharing, real-time document collaboration, and more. Why this tool stands out: This tool is built around its core functionality, Pages. They act as a canvas for teams to collaborate by creating content, sharing tasks and communicating real time. In this, their approach is slightly different from most team chat apps. Azendoo is a work communication and collaboration application that helps teams plan and share tasks, work on projects and communicate effectively. Why this tool stands out: Azendoo probably has the most extensive feature list of all the tools on this list. Its complete “work tracking” solution is so feature-rich it probably has everything you need to get work done — outside of emails & meetings. 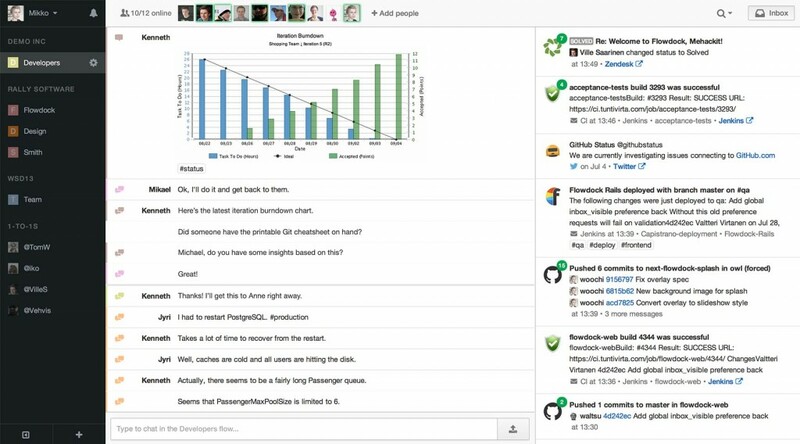 Stackfield combines encrypted project management software and team chat. It’s an integrated platform, so it offers more than just messaging — in fact, it promises to cover all aspects of collaboration. Why this tool stands out: While Stackfield is quite impressive in its feature-richness alone, its main selling point seems to be its data security standards. Based in Germany, they emphasize their end-to-end encryption and compliance with not only European data privacy policies (GDPR), but also the German ones, which in many cases are even stricter than EU laws. So, if that’s important to you, Stackfield might just be the tool for you. Pricing: From 29EUR per month (for up to 10 users) upwards, with a free trial available. Wimi offers a digital collaboration suite that helps companies stay organized and make teamwork more efficient. Wimi goes beyond team communication, as it also offers files & drive, tasks, calendars and video conferencing. Why this tool stands out: Wimi truly stands out as a “all-in-one” solution. From messaging to calendars to documents with version management, Wimi is a complete package. Very few tools even try to do this much inside one platform. There are many tools that didn’t make the list, and even more tools that would have, once upon a time, belonged to this list but have since changed their focus or shut their doors (HipChat, Stride, Redkix and Mainframe, to name a few). As online work communication and collaboration tools are a relatively new field, and it’s constantly evolving, we look forward to seeing how the world migrates away from email to more and more tools that offer team communication. Follow Fleep on Twitter and Facebook to keep an eye on our news and updates!